Full disclosure – I was provided an advanced reader’s copy of this book by the author but have voluntarily provided a review. All opinions are my own. Sila Gatherer lives a sheltered life on her planet Terra Agri 5. At the far ends of Alliance airspace, her people have mostly enjoyed the protections of the Alliance without the wars and strife that has plagued the other planets in the system. But her life takes a drastic swerve when while on a gathering trip one day she is whisked up into a passing alien ship. Finding herself alone in a strange environment with creatures that she has only heard rumors of, Sila is out of her element but manages to form a relationship with Zh’hir. The Star Captain becomes her protector and defender as Sila navigates the new reality that faces her. As an ambassador for her people, Sila learns that her small insignificant planet may play more of a role in intergalactic dealings than she could ever imagine. 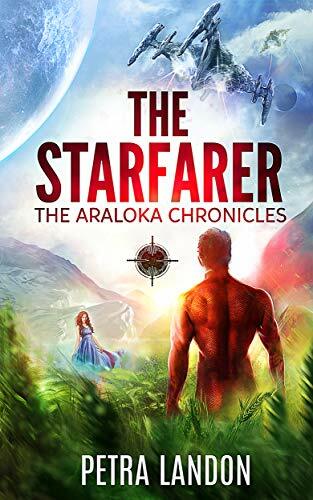 As the follow up to last year’s “The Mercenary”, “The Starfarer” is also set in the same world as its predecessor but works just as well as a stand-alone novel as it does part of an overall series. Sila’s story was an interesting if not a unique one. As a veritable loner on an agrarian world, she has inherited a strange gift that eventually sees her exiled from her own people. To make matters worse, as the only person known of her race to possess this gift, questions arise as to how she came to possess such a skill. While many of the same places and a few characters make an appearance in the story, Landon has crafted The Starfarer in such a way that nothing is lost by reading the books out of sequence. For me having previously enjoyed The Mercenary, this new novel was a really nice way to catch up with Zoran and Saakshi in addition to becoming acquainted with the new players in what is shaping up to be a very interesting series. But, where The Mercenary struck me as more of a classic romance, The Starfarer at times held a bit of melodrama that would rival even the longest running soap opera. Even with that being said, Landon has delivered with a second book in the series that is worth the read for anyone who likes their Science Fiction filled with alien races, fascinating places and just enough drama to keep it all interesting. After having been introduced to the Mercenary and the Starfarer, Landon’s next installment is The Sentinel. Once again, I will be looking forward to catching up with the inhabitants of Sector Araloka to discover what more adventures are in store.